The Cirneco dell’Etna survived thousands of years on the island of Sicily because of its skill in hunting small game, both mammal and fowl, but primarily rabbit. The elements necessary to succeed in a hunt – independent intelligence, acute sense of smell, sound and sight, alertness – were employed to allow the Cirneco to be used for the purpose of guard of the home as well as obedience and agility before the breed was known outside of Italy. 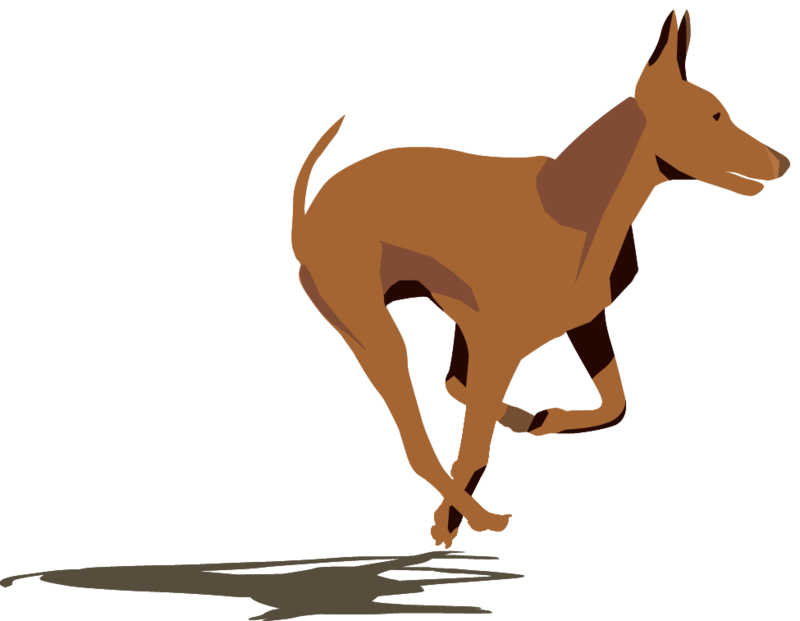 With the introduction of the Cirneco to the United States came the breed’s participation in the sport of lure coursing. Although the Cirneco hunts primarily by sense of smell he also employs sight and sound. In Coursing, the Cirneco must abandon his reliance on the primary sense and, additionally, learn to run across open ground. Although there are times when, having flushed a rabbit, the Cirneco can “course” employing sight as it takes the rabbit to its burrow, this is contrary to the normal “hunt” which involves “tracking” on rocky slopes and through dense brush. The conformation ring is a venue that Cirnechi relish. It renders the opportunity for mental and physical stimulation through interaction and discovery of new people and places, in addition to the opportunity to showcase an elegant and distinctive breed. The Cirneco, by nature, requires not only physical but mental stimulation. 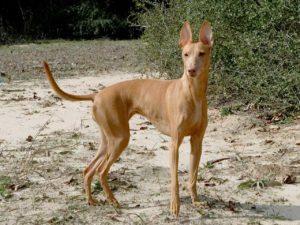 It is inquisitive, intelligent and in need of a function whether competing in the show ring, hunting, coursing, agility, or as an interactive family member. Written by the Judges’ Committee based on documentation supplied by the Breed Club 01.06.93 Translated July, 2001 for the Italian Kennel Club (ENCI) by Jane Moore. 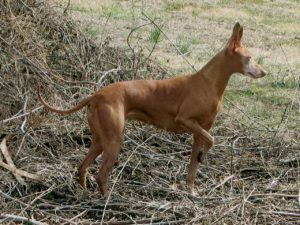 The Cirneco dell’Etna is a breed that has recently been classified as “primitive” and included in the 5th Group. Its specialization is hunting wild rabbit. Search: While exploring, the dog’s gait changes from a trot to canter with a sprightly pace depending on the unevenness of the ground. The search for scent is always meticulous, detailed, attentive and thoughtful. These characteristics are typical on the walls of volcanic rock. The search must be incisive and detailed, covering all the ground. Method: When the Cirneco becomes aware of the presence of game, it leaps forward and follows the scent left by the rabbit on the ground. If it realizes that the scent has disappeared, is less intense, or does not lead to game, it returns to its previous activity and starts searching again exploring the terrain. Otherwise as it follows the scent, if it realizes that it will lead to game, it continues behaving in the same way with total commitment to following and interpreting rapidly the quality of the scent leading to the game. The dog becomes more expressive and the action increases in impetus as the distance between itself and the rabbit diminishes. When the rabbit is just ahead, the Cirneco occasionally barks shrilly, with increasing frequency, almost becoming furious when it thinks it has reached the hiding place or the right entrance to the warren the rabbit has entered. Here the Cirneco digs with its front paws, it sniffs, violently inhaling inside the hole, it snorts and the barking becomes louder, vibrant, howling, then at times quietly whining, full of anger and impotence as it persists in its attempt to dig. Its voice resumes, resonant and vibrant, indicating that the rabbit is moving inside the burrow. Now it is the ferret’s turn, the dog must respect the ferret, it must stop digging, move aside and remain completely silent, perhaps lying down and curling up, seemingly indifferent, but in reality attentive to what is about to happen. Removing the dog is tolerated if it is particularly highly-strung. During the hunt, when the Cirneco comes across a strong scent which leads it to a shelter away from the rabbit’s temporary cover, be it in a bush or behind a stone, below a wall, on the edge of a bramble, under a few stones, or any other place which is not underground, the dog’s behavior is the same as described above when the rabbit is just ahead of it, before reaching the temporary cover. In thick impenetrable bushes, the Cirneco bites and tears the branches and thorn bushes in order to reach the rabbit, showing courage and determination. Should the Cirneco suddenly come across game in its seat, it will flush the rabbit, making it flee. In this sort of situation, some dogs show pointing behavior of varying degrees. The judge must give great importance to this behavior. At the rabbit’s fresh cover, after the rabbit has crept away, a short hesitation is permitted, without insisting or giving tongue. However, the dog must pick up the scent and follow it rapidly, keeping close to the trial. If the rabbit has been flushed out in one of the previously described situations and has reached cover or the entrance to a burrow of some sort which is extremely secure, then the dog must start off again, pick up the scent and track it without any hesitation, distraction or errors, until it reaches the rabbit’s new cover. This is the only time when the Cirneco works like a scent hound, and it is an essential and desirable characteristic on volcanic rock, in bushes and on open ground. Style: The Cirneco carries its head in the manner of a dog searching for ground scent, that is with its fore-face not far off the ground. The tail is held in a wide arch over its back, sometimes it straightens out and indicates with violent wagging the various stages of the hunt. The ears alternate between being completely erect when it suspects the presence of game and slightly laid back against the head while on the move but not alert to prey. The ears must never be relaxed. The Cirneco dell’Etna pricks its ears up immediately when it perceives the presence of game during the hunt. The dog’s muscles contract becoming evident, at the same time it lowers its tail which almost becomes horizontal wagging laterally with frenetic impetus. The style is a harmonious fusion of physical, psychological and physiological qualities; consequently the tone of the voice, as well as the elegance and typicality of the gait, contribute to the assessment of the salient characteristics of the breed. Criteria for assessment: The retrieve is not a specific characteristic of the breed. Some dogs perform it perfectly, some collect game from a great distance, an action which is held in great consideration. Most dogs mouth the rabbit to release tension. Each of these behaviors is correct and is not decisive for assessment, but is a point of merit. The Italian Work Championship requires 2 CACs in either of the two types of trial, or one CAC in each type. Cirnechi registered in the LOI book or LIR book may be entered for the trials. Trials for unregistered dogs may be held at the same time as the official trials but without awarding the CAC. The organizers may decide to program trials where the dogs work individually or in a brace, as long as in the latter case, the judge’s assessment, and consequently its placing, is expressed individually for each dog in the brace. The order of running shall be decided by draw. The turn will last for a minimum time of 20 minutes to a maximum of half an hour. The trials may be judged by a single judge or by a multiple jury. The judge may require the help of an assistant, after approval by the organizing committee. In trials shooting over game, the judge may be the gun himself or be accompanied by an official shooter. Dogs that do not make a tenacious effort in their work; that hesitate on a scent trail; that are distracted and do not cover the ground designated for their turn within the first 5 minutes, will be eliminated from the trial. The highest award will be given to a dog which has demonstrated work which is perfectly in line with the work standard, as long as this work is performed in the most fluid and spontaneous way with relative speed. The highest award will not be given, even though the various stages of work are in line with the desired behavior, to a dog which does not give tongue on fresh scent near the rabbit’s temporary shelter; a dog that does not give tongue at the rabbit’s temporary cover; a dog that on reaching the entrance to the burrow does not demonstrate zeal and pertinacity; a dog that has indicated the temporary cover but it was not possible to verify the flushing out of the rabbit by using the ferret; a dog that abandons a scent trail to pick up another even if afterwards it returns to the first and concludes positively; a dog that is not able to pick up the scent of the rabbit that has left its cover and where it was possible to see it or sense its hiding place; a dog that continually hunts out of range of its handler and shows no contact or does not respond to the recall; a dog that gives tongue unnecessarily and insistently during the search. In each case the judge will assess to what extent the standard was not adhered to and will award by degrees a lower qualification, also taking into the utmost consideration the intelligence, intensity of the action, method of search, resistance to fatigue, courage in facing obstacles, autonomy in contact, instinct for game, pace. Reference should be made to the General Rules for Canine Events and Work Trials authorized by ENCI for anything else that is outside the specific criteria of the work trials for Cirnechi and comes under the General Rules which govern “Canine Events”. Most Cirnechi love the excitement and attention found in the conformation ring. Recent years have seen the breed begin to receive the recognition it deserves in the Hound Group and Best in Show rings. This is a breed which is very often “owner handled” which adds to the fun for many. American Kennel Club – Effective January 1, 2015, the Cirneco dell’Etna has been eligible to participate in the conformation ring within the Hound Group. For additional information regarding AKC Conformation rules please see Chapter 3, Section 23 of the Rules Applying to Dog Shows rule-book by clicking here. Federation Cynologique Internationale – The Cirneco is eligible to participate worldwide as a primitive hunting dog in Group 5 – Spitz and Primitive. Under this venue multiple Cirnechi have taken World Champion titles. 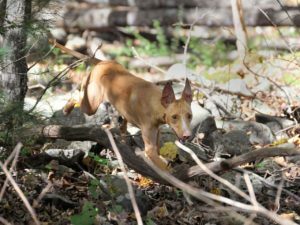 Sighthound breeds have an overpowering instinct to chase. 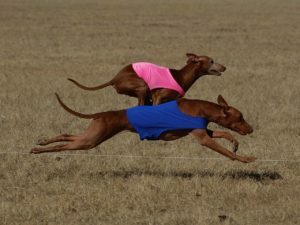 Lure coursing presents an opportunity and is meant to simulate the pursuit of prey in the open field. Courses are usually between 500 and 1000 yards in length and the course is designed to simulate the irregular path of game being pursued. There are a number of lure coursing trials held around the country throughout the year. These events are sponsored by both the American Kennel Club (AKC) and the American Sighthound Field Association (ASFA). To locate a lure trial near you or to learn more about the sport of lure coursing, visit the AKC or ASFA sites. CdECA sponsored lure coursing events are listed on the calendar found on the Events page. A qualifying score is 50% or more of the total points from each judge.